Well, why not? What can we do as a collective of animators and animation fans to change this? The industry is booming now more than ever, and we can only imagine how much more exciting it will be in the future if we start getting our kids into it sooner! Here’s our hot take on what we can do as parents, teachers and a society to get our kids more excited about not just the next big Pixar release, but the process behind it. The first step to getting kids excited about the possibility of becoming little animators themselves is getting them into animated stuff. This is actually pretty damn easy, so let’s not linger. Just the other week, I was wandering around a supermarket where I saw a father with his young daughter doing their weekly shop. Throughout the entire shopping experience, she was belting out How Far I’ll Go, the headline track from Pixar’s Moana. The haunted, broken look in the father’s bloodshot eyes suggested to me that: for some parents, getting their kids to stop being so obsessed with animated series and movies is the problem, not getting them into it. There are more animated shows for kids now than ever before. I’ve sat down at the pub with male friends and talked through the merits of the various reboots of our favourite childhood cartoons, all having been exposed to them as fathers, uncles or big brothers ourselves. Once your kid is interested in animation, the DVD extras are a great place to go for a little more documentary-style information about the process behind how they’re made. I know, I know, we all use streaming services nowadays, but take a look on YouTube, you can usually find this kind of stuff on there too. 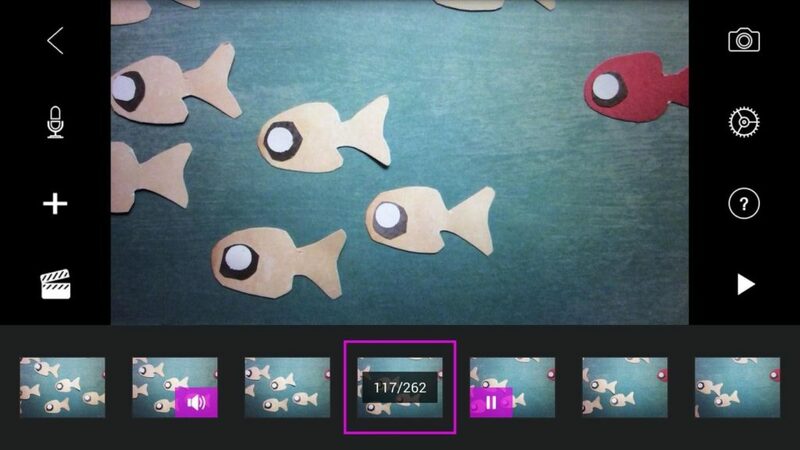 A stop motion project is the ideal starting point for introducing kids to the basic ideas behind animation. It’s cheap and you can jump right in without having to learn how to use a complex piece of software. All you really need to get started is a phone with a camera. Head over the app store and download Stop Motion Studio, they have a free trial version here which should be plenty powerful enough to let you know if your kids are into it or not. Then set up a bright, clear spot where you can prop your camera looking at plenty of space. Now that you have your filming station set up – what to shoot? There should be no shortage of willing toys ready to become your kid’s next leading character, so grab Elsa or Optimus Prime or whoever, and start posing. After you’ve shot a series of frames for the stop motion video, give kids the chance to record their own sound effects, narration and dialogue. This should encourage them to break out of the rigidity of the stop motion visual process and be a bit silly if they want! Projects like these are perfect for getting kids into animation because they’re fun, cheap, easy to get started with. They also introduce kids to some of the digital aspects of animation such as frames and the illusion of motion. If this goes down well, the next step would be to bust out the modelling clay if you’ve got a really creative kid on your hands! There’s no animation without drawing – even though most of it these days is stylus on tablet – a perfect way to introduce youngsters to traditional hand-drawn animation is to let them pick up a pencil themselves. Creating fun little storyboards are a great way to introduce youngsters to the animation process without getting into an expensive, complicated bit of software. Giving them a few storyboard cards allows them to plan and draw in a manageable way, giving them an outlet for creativity without intimidation. Alternatively: why not give flip-books a go? They aren’t just for bored students to make out of their exercise books, they’re a small scale way to make a traditional, line drawing animation that fits in your hand. “Jamie, you fool. I love my child, but not enough to dedicate the rest of my life to teaching them how to make a 3D animation!” Alright, calm down, I’ve only gone and sussed out an easy to use, time-saving way to teach 3D animation in a way kids will love. It’s free as well! Kids already love Minecraft, so why not tap into that frighteningly powerful addiction to actually teach them how to animate in 3D? That’s the idea behind Mine-Imator, a 3D animation tool where you can use assets from Minecraft to make your very own animations – cutting out all the faff of modelling, rigging, texturing and lighting. Like most of the tips here, this more is aimed at letting kids get comfortable with the ideas behind animation in order to let their imagination get to work and encouraging them to tell a story, not get bogged down in the technical aspects of animation. Sadly, creative disciplines tend to be some of the least supported in schools. If you’re lucky, your kid will get some decent lessons on painting or pottery, but elsewhere it’s little better than potato printing, let alone anything digital. Fortunately, there are some outliers. Loads of schools will have an equivalent of an AV club, one near us has an animation club which is mostly for watching anime and cartoons, but it’s a start! See if local schools have one of these, if not – why not start one? Failing any lessons on animation from academic sources, it’s often fallen to private companies offering courses or better yet: free online resources. Khan Academy is one such resource that has recently been stepping up its animation-based offering by partnering with Pixar for a series on computer animation called Pixar in a Box. The production on this course looks slicker than Johnny Bravo’s quiff and it works great as a primer for kids interested in how their favourite Pixar movies are created. So you’ve tried all of the above and your budding animator is still begging for more, it might be time to consider making their animation education official. As I just said, there’s a few outliers when it comes to getting a decent higher education course on animation. There are a handful of really decent options here in the UK; Universities like UWE, The Royal College of Art, Kingston and the big one: Bournemouth, all offer courses ranging from video game design to illustration with animation. We’ve had graduates from Bournemouth come straight out of university to work for us, so we’re living proof that these universities do place animators in employment! Content Producer. Jamie is responsible for keeping our prospects, clients, friends and followers updated through our Journal and Fudge Labs articles. Prior to blogging for Fudge, Jamie completed a Masters Degree in English Literature from the nearby University of Reading. When he's not writing or editing, you can find Jamie playing video games and dreaming about VR.